​​Peppers are super sensitive to their environment​ requiring the right conditions to germinate and thrive. ​There's a lot of things new growers and even experienced gardeners may not know to do to. The good news is you can create these conditions in your home when you ​start them indoors. ​I remember doing everything that books and videos said to do, but then I'd still lose my plants. It would always be seemingly "out of the blue." For example, I'd have a seedling that would get tall, leggy and then just fall over and die. It was so frustrating not to know why ​this happened! ​Often, a lot of problems are due to very simple ​reasons​ that tend to get skipped over in gardening instructions. I don't know if it's because the information is considered common knowledge, or if it's so "minor" that ​no one mentions it. Who knows? ​​A tall, lanky seedling, for example, ca​n occur when it's not taken off the heat source and removed from under the lid. ​This wasn't mentioned in my gardening books, and it took a lot of ​asking for help on ​gardening forums ​to ​figure out this step I was missing. 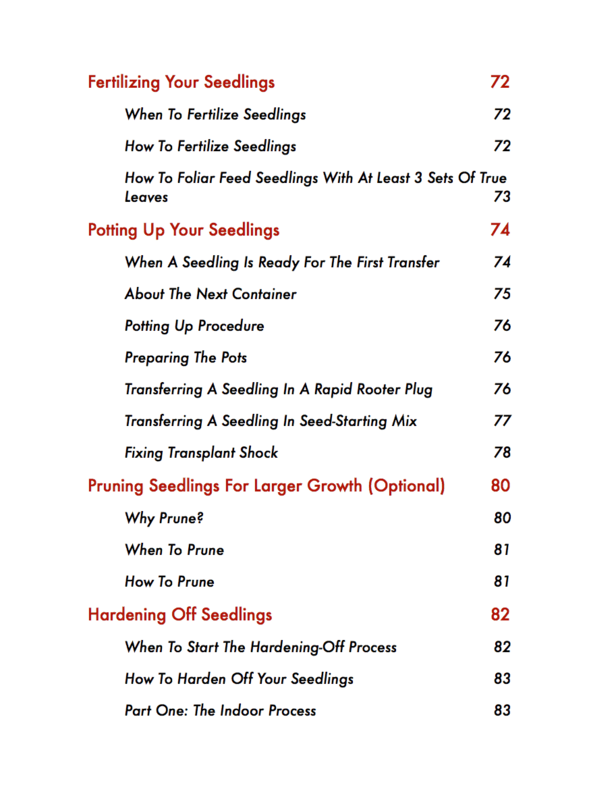 That's why ​you'll find whole sections about what to do after germination and even ​dedicated information about using your lid (see the Table Of Contents below). These "little things" make all the difference! ​Once you grow chillies, you'll find that you can grow so many other plants too​. That's empowering! Just don't give up​. Whether this is your first try or your last because you think you "failed" in previous attempts, you've got this. We'll do it together. ​Thanks so much for reading! 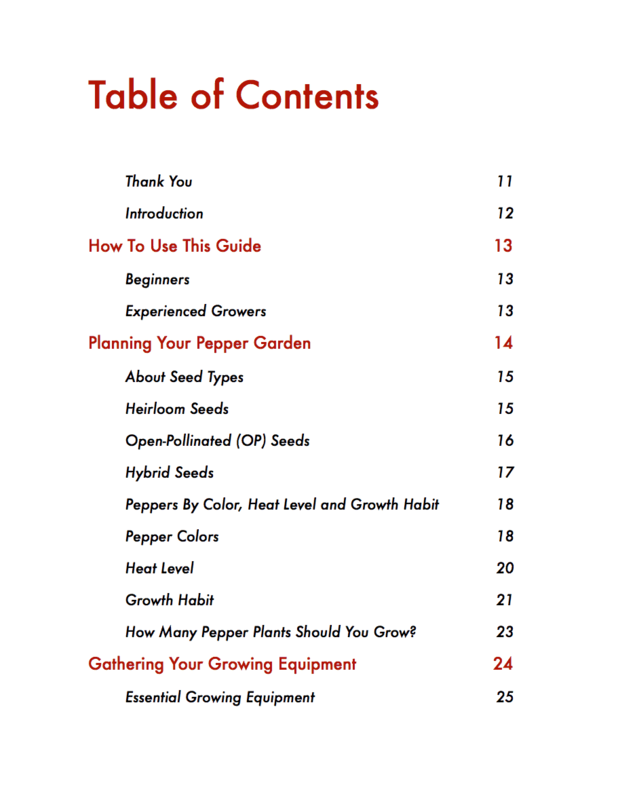 ​What's New In This Pepper Seed Starting Guide? ​Planning Your Pepper Garden: Learn about seed types, get examples of chillies by color / heat level / growth habit, and get an idea of how many plants you should grow. ​Essential Growing Equipment: Everything I use to successfully germinate and grow indoor seedlings each year. And, if you don't want to buy any equipment, I describe how you can use household items to create your grow station. ​Preventing Bugs Before You Plant: Ever see those annoying, flying insects when you attempt to garden indoors? You'll learn where they come from and, more importantly, how to prevent them​! Prepping Your Seeds: Understand how to inspect, soak and perform a seed viability test so you only plant the best specimens that are most likely to germinate and turn into healthy plants. Prepping Your Water: What kind of water you use is very important. An incorrect pH level can deter your efforts. Sowing Your Seeds: You'll learn three different ways of planting your seeds so you can choose the method that works best for you (more on this ​below). 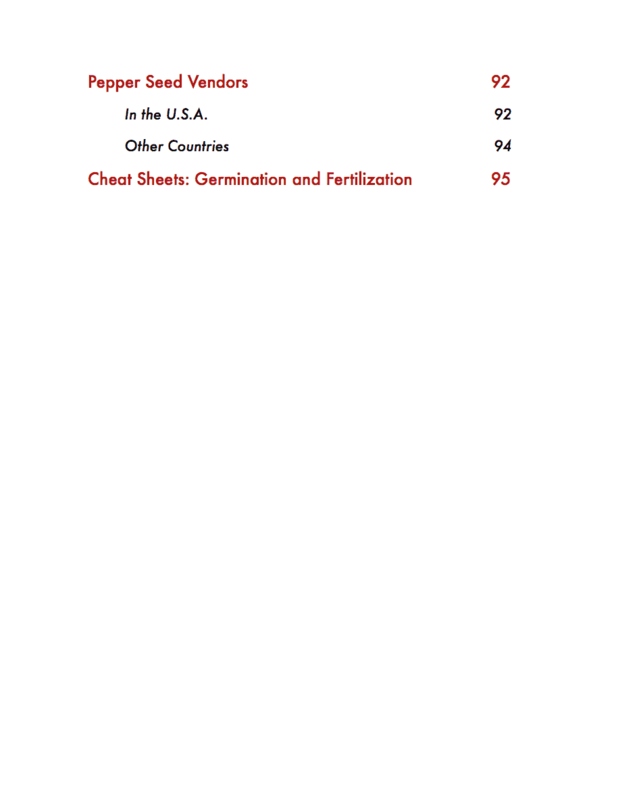 Germination Topics: What to watch for, how long it can take and what to do if you have germination problems. 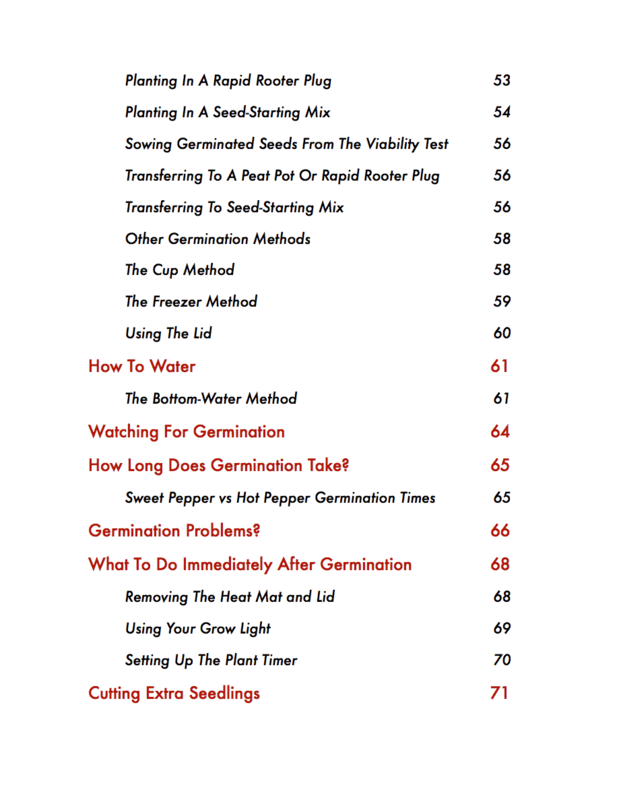 What To Do Immediately After Germination: All those "little" steps that can make or break your plants. You'll know exactly what to do after your seeds sprout and during each growth phase. ​Fertilizing Your Seedlings: When and how to feed your plants including a recommended foliar feeding schedule for even more nutrition. Potting Up Your Seedlings: Know when to transfer your seedlings to new containers and how to do it in each of the three ​methods described. Pruning Seedlings For Larger Growth: This optional step explains when and how to trim your plants so they grow a more compact, stocky structure that encourages more chillies during the growing season. When Are Seedlings Ready For The Outdoors? : Know when they're ready to go outside, a few ways to plant them and tips/resources for outdoor growing. ​​Resources - Tool Suggestions: ​Where to find all the products mentioned in the book so you can get started fast! ​​Resources - More Information: ​Links to ​Grow Hot Pepper's articles on pests and diseases, feeding your pepper plants and winterizing them. 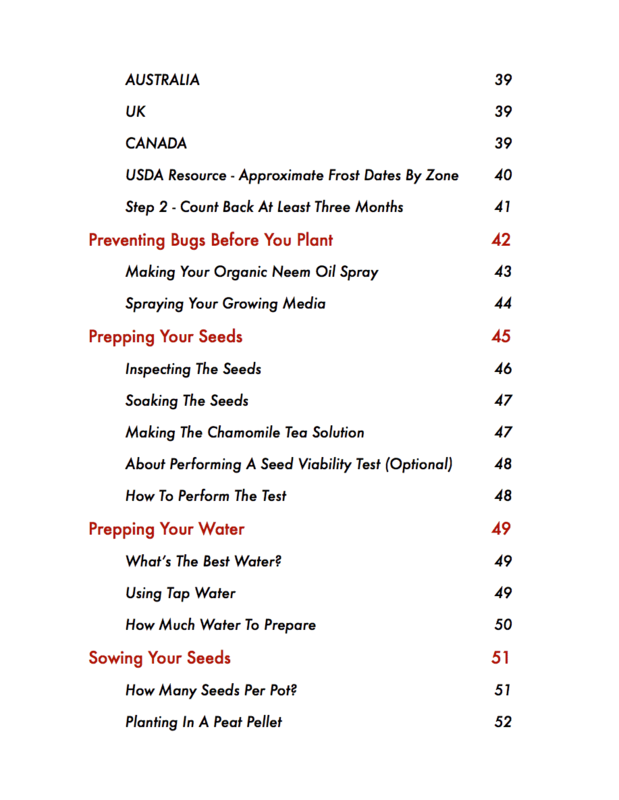 P​epper Seed Vendor List: ​Th​is popular resource is now included at the back of this ebook for your convenience! You'll find ​links to businesses (both in the U.S.A. and other countries) that offer all kinds of pepper seeds. ​​​Unlimited Choices: You are no longer dependent on what plants your local nursery has in stock. Grow the new hottest pepper in the world or whatever strikes your fancy! ​​Applicable To All Kinds Of Outdoor Growing: ​​When ​seedlings are ready for the outside, it doesn't matter whether you ​put them in the ground, containers or a grow system such as an Aero Garden. Knowing how to start your own seeds is valuable ​no matter the path you choose! 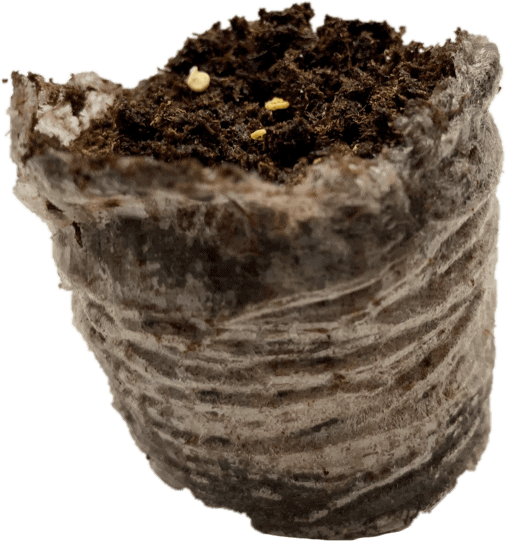 ​​A peat pellet is one option for starting pepper seeds. 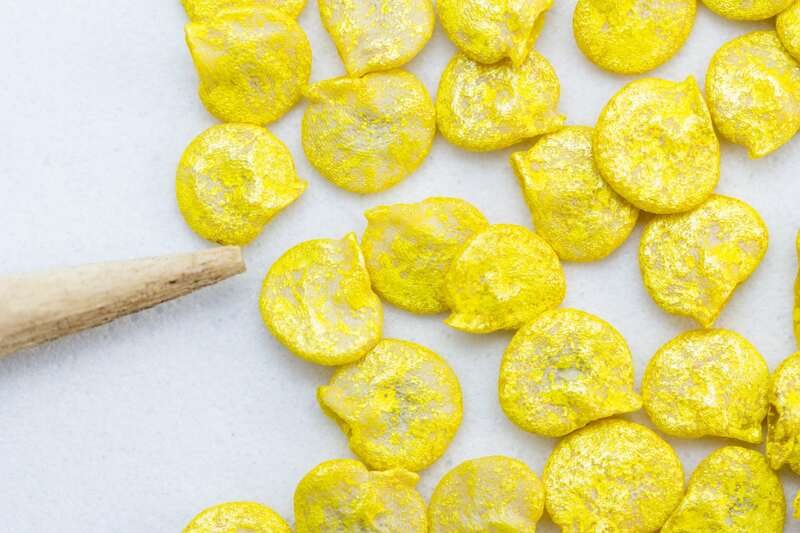 ​How each growing media works and why you might choose one over the other. ​All the specific growing details for each option. ​Key differences in growing tasks, such as watering and potting up your seedlings, so you know what to do every step of the way. ​Note: You have a lot of choices when it comes to growing media. The three options listed ​all work well for peppers and are generally easy to acquire. This ​starting point ​will help you go on to develop your own growing preferences. Q: Do ​​I Have To Buy A Lot Of Equipment To Get Started? ​Absolutely​ not! 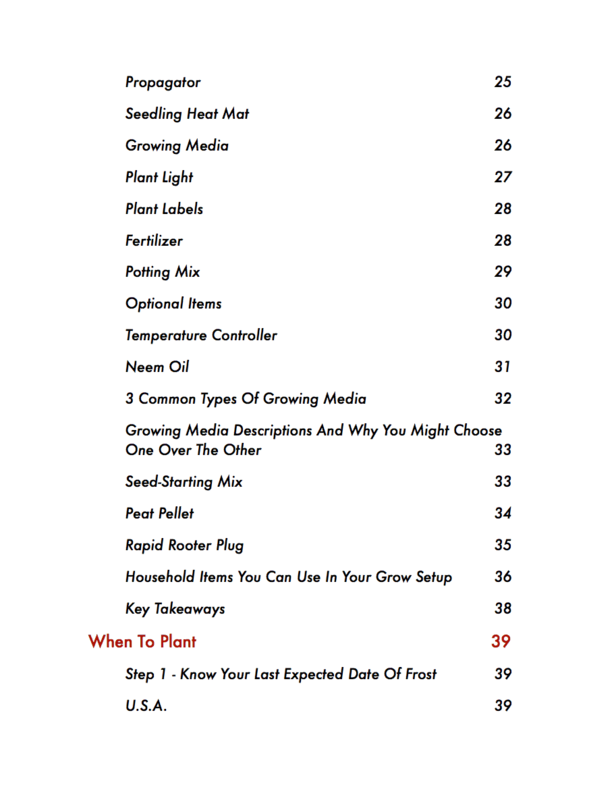 In fact, this ebook has a whole section ​about how to use household items for your grow setup. ​Certain ​products, such as a plant heat mat, ​make growing chillies a lot easier. Ultimately, it's up to you whether you want to follow the recommendations or not. 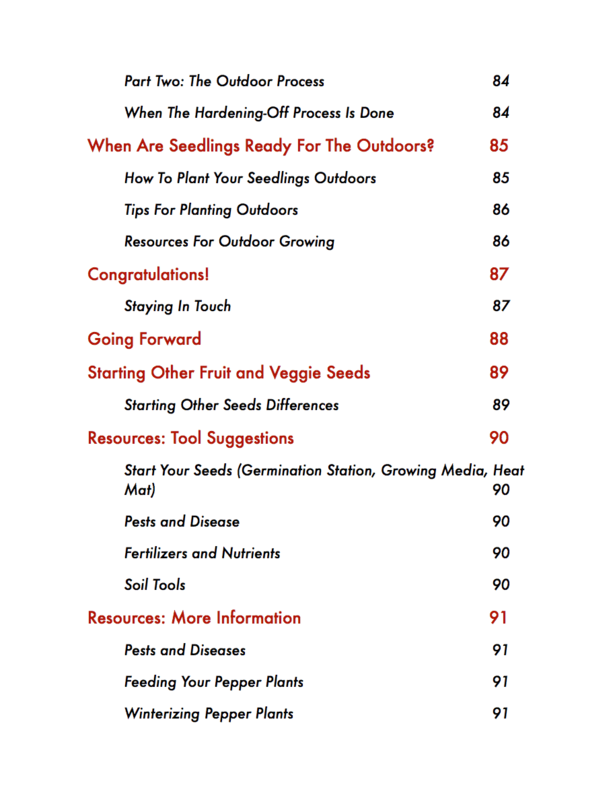 ​Q: What Will I Be Able To Do With The ​​Pepper Seed Starting Guide? ​​After acquiring quality seeds (refer to the Pepper Seed Vendor List if you need help), you'll be able to plan your pepper garden, germinate seeds ​and grow ​out your seedlings to the point where ​they can safely go outside. You'll ​learn many crucial steps including when to plant, how to sow seeds indoors in various growing media, how to feed young seedlings, how to prune for better growth and how to harden them off. Most importantly, you'll know when to do everything so you produce the healthiest plants. Q: ​How​ Long Will This Whole Process Take? ​​It's really hard to give a definitive answer because each pepper variety has different germination times. (Some chillies sprout in a couple of days, while others can take a month or more!) Additionally, other factors in your environment, such as temperature, ​affect this time. Generally,​ expect your peppers to be inside for 3 to 4 months, from seeds to ​outdoor-ready plants. ​Q:​ What Makes Your Ebook ​Different? 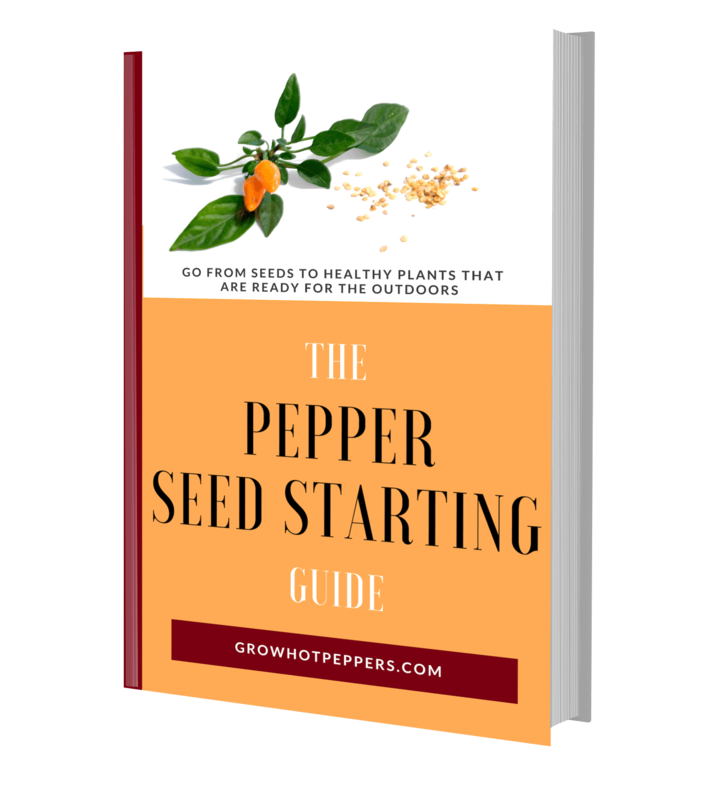 ​The ​Pepper Seed Starting Guide comes in PDF format so you will instantly receive a download link after payment is received. You can ​view your e-book file on your computer as well as mobile devices.